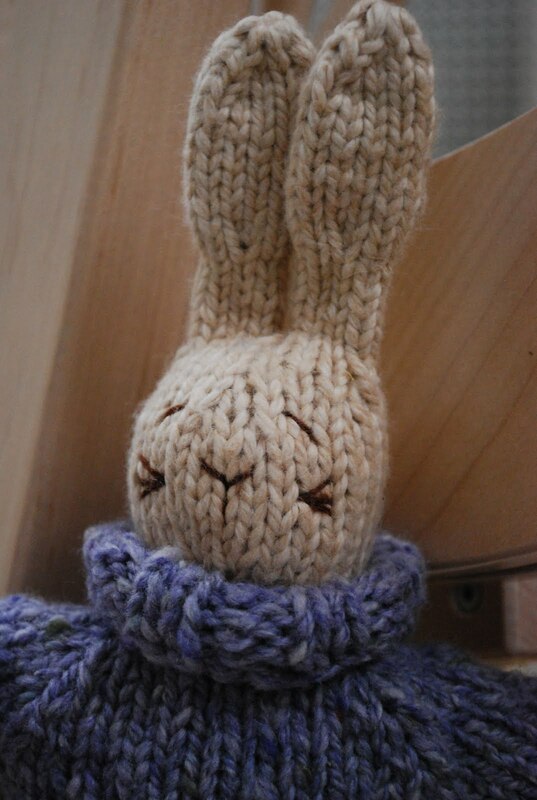 I actually swatched and cast on for this a couple of weeks ago, but I've been distracted by bunny knitting. As soon as Hop II is finished, though, this will be my main focus. It's somewhat slow going, because each row involves three different stitch patterns. I'm hoping the enthusiasm I'm feeling now and the need for a cozy sweater to keep me warm will keep me going. I promised you a successful project, and here he is -- hello! This little bunny was such fun to knit. He's knit seamlessly, from his bulbous bunny feet to the top of ears, as is his sweater. 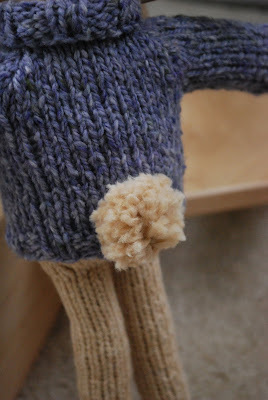 The only real "finishing" involved is sewing up or grafting a few spots when the parts are joined together. 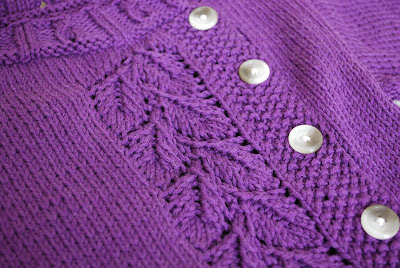 For Hop's sweater, I used a little bit of yarn leftover from my Climbing Vines pullover. 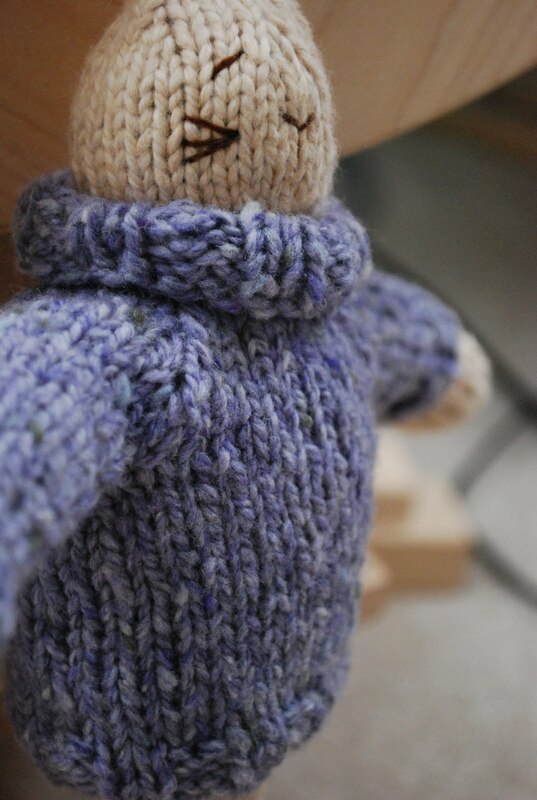 His embroidered face was done with a couple of plies of brown sock yarn (I think leftover from Mr. Foster). The only modification I made to this bunny was to leave off the carrot on his sweater. Someday I may do Rainbow's initial in duplicate stitch, but for now I like it the way it is. I especially like a cute little feature that you can't see in the pattern photo -- a bushy bunny tail, complete with a hole for it in the sweater! 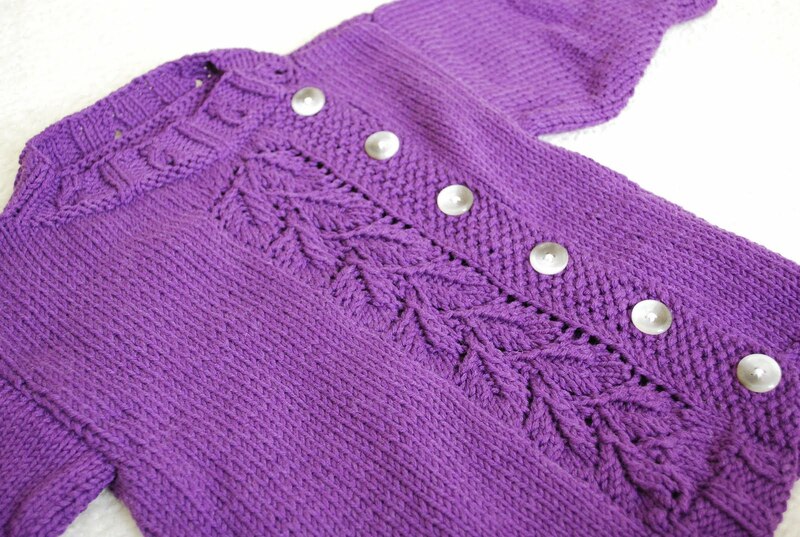 This pattern was so much fun that I'm knitting it again for our newest cousin! 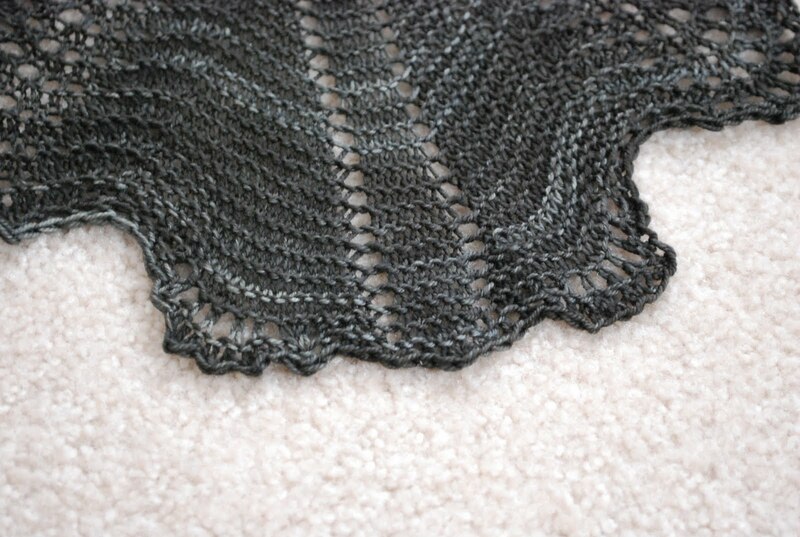 On to unblogged FO #2 -- this time, it's my last entry in the Summer of Socks and Lace 2010 contest (no, I didn't win). I'm pretty sure this yarn was the first skein of Malabrigo I ever bought, so it was pretty well marinated in the stash by the time I pulled it out. 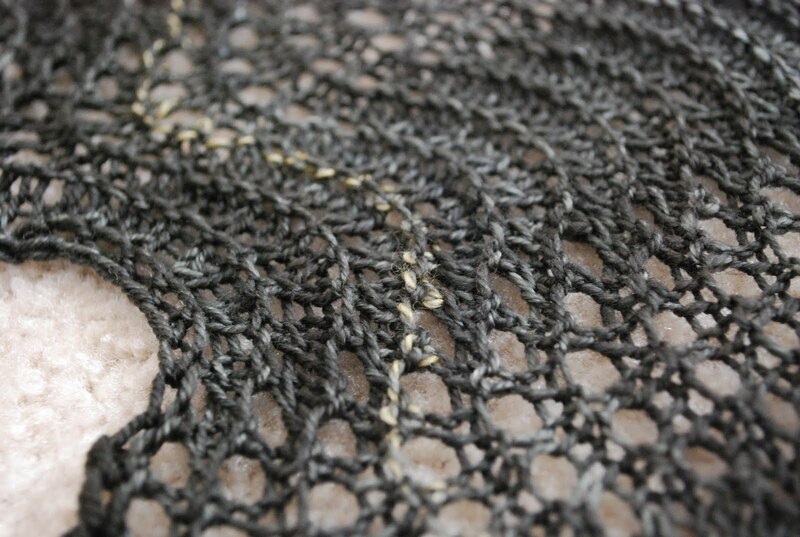 I thought this steely gray would go well with a pattern that's named for an area of the Pacific Northwest, and I always like the look of a semisolid yarn with garter stitch. There was one bit of weirdness in this skein. As I was knitting, I noticed about a yard's length where one of the plies of yarn looked different and there was clearly a join. 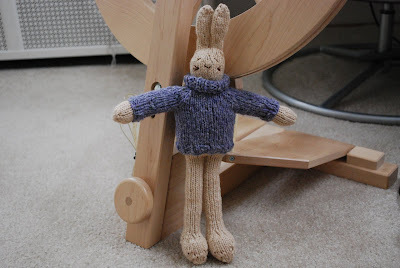 The color was ever so slightly different, and that different ply was a lot fluffier than the rest of the yarn. After washing, though, it appears that whatever dye was in that ply washed out, making it really stick out. Can you see it here? My guess is that this bit of yarn got spliced in while the yarn was being plied, but I suspect that the weird addition is not the same fiber content as the rest of the yarn, because it seems to have taken the dye differently. 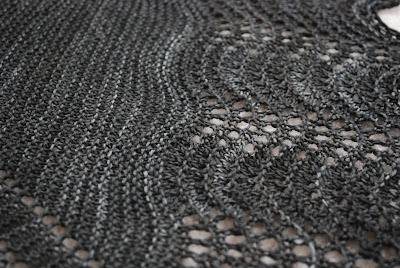 Luckily it ended up in the feather and fan section of the shawl, so I don't think it's as apparent as it could have been. 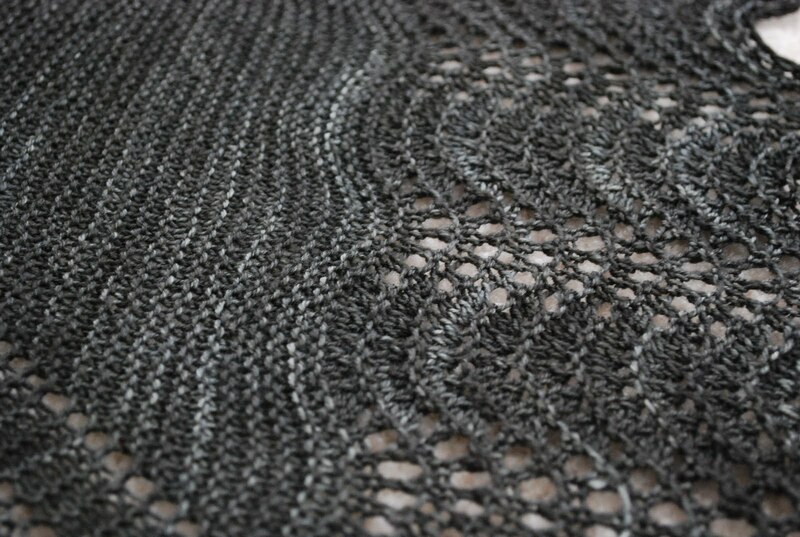 You all know that I'm an aggressive blocker when it comes to lace, but when I blocked this, all I wanted to do was get it done. I just didn't have the energy to pin and repin until it was just right. The good thing is that it's a cinch to redo if I want to, and even if the blocking leaves something to be desired, this is going to make a lovely soft scarf for the winter. 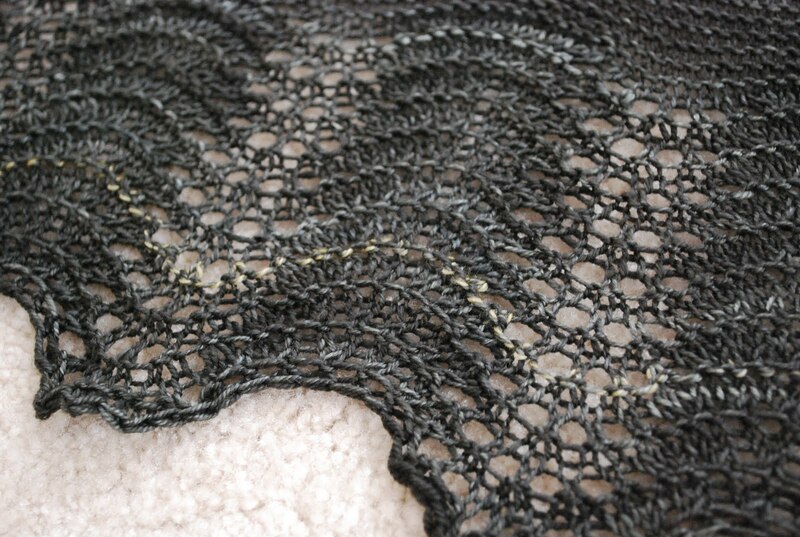 I've really come to the conclusion that Malabrigo Sock is better suited to scarves and shawls than it is to socks, so I certainly don't regret using this for a bit of lace. 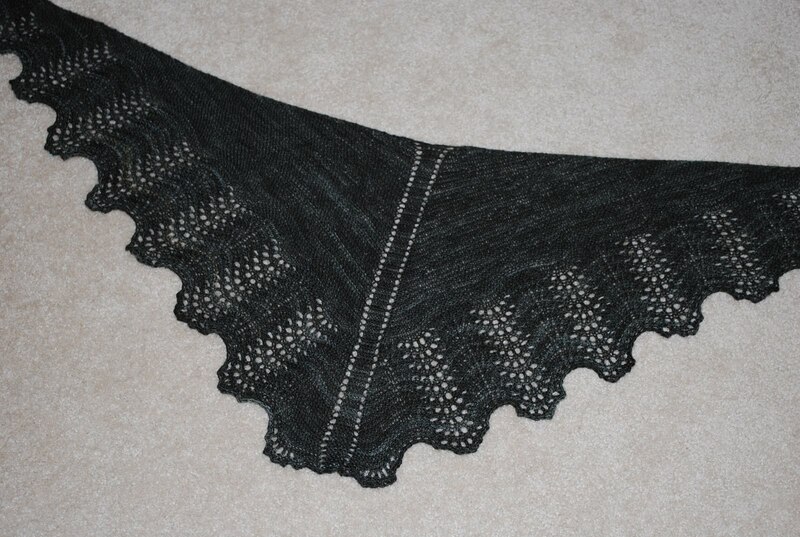 There's still one more FO to come -- and I promise it's a winner! I have been trying to get a blog post up for about two weeks now but have been thwarted by a crazy schedule and a nearly 9-month-old who has demanded my attention. I've got quite a backlog of things to show you, having recently completed two projects and gotten pretty darn close to finishing another, so let's just start with the oldest, m'kay? I was a naughty knitter and didn't swatch for this sweater. 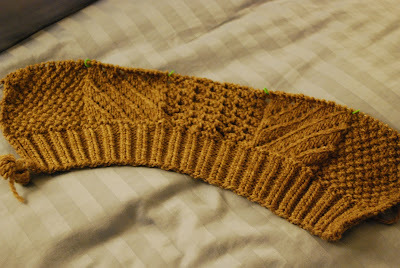 The yarn was leftover from my Mommy Snug, so I based my needle choice on the needles I used for that sweater (I'd used a 4 for mine, so I went up a size so that the fabric wouldn't be quite as dense). I thought I'd do a couple of sizes larger than what Rainbow was wearing at the time so that there would be a chance she'd still fit into it by the time I finished. 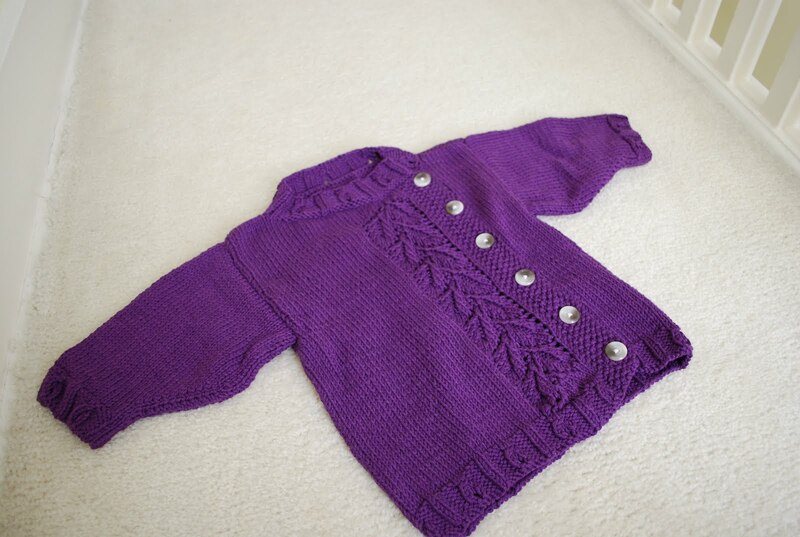 It turns out that I needn't have worried; this looks to be more like a 2T than a 12 month size, so it'll be a while yet before she can wear it, but by then I hope she'll have stopped growing so quickly and will be able to wear this for a while. The nice thing about Cotton Fleece is that it's a great all-weather fiber blend. It's probably not the warmest in the middle of winter, but it'll be good for spring, summer, and fall. I thought it was quite appropriate that I used yarn leftover from my pregnancy sweater to knit something for my baby -- both patterns by the same designer, no less, and I even found more of the same buttons! Unless there's a major surprise, we'll never be wearing our sweaters at the same time, but there's plenty of years ahead for us to be matchy-matchy. And we still have our February Sweaters to wear this fall and winter -- that is, if Rainbow hasn't outgrown hers before she's had a chance to wear it!